I always welcome the opportunity to say thank you to the readers of Soul Serenade for continuing to read my weekly column, now in its fourth year. This week the good folks at Rhino Records have given me the opportunity to say thank you in a big way. 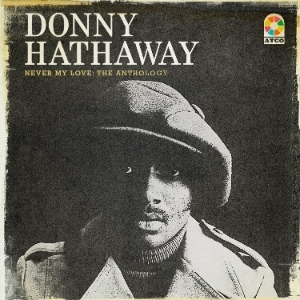 Five lucky readers will win a copy of Rhino’s latest release, the magnificent four-disc Donny Hathaway compilation Never My Love: The Anthology. Read through to the end of the column to find out how to enter. On January 13, 1979, Donny Hathaway fell to his death from a 15th floor hotel room window in New York City. At the time he was recording what would become his final collaborations with Roberta Flack. The commonly held opinion is that Hathaway jumped from that window, but as always, there were people who thought that foul play might have been involved. As the years went by however it became clear that Hathaway had waged a brutal war with mental illness in the mid-late 1970’s. Hathaway was born in Chicago, but grew up under his grandmother’s roof in St. Louis. He began singing in the church choir, and eventually won a fine arts scholarship to study music at Howard University in Washington, DC. Hathaway was totally rooted in gospel, but in college he found himself in need of some money and began playing piano in schoolmate Ric Powell’s light jazz trio. That’s where his education in jazz, blues, and R&B began. Money problems continued however, and in 1967 Hathaway quit school. Fortunately around that time he got a call from Curtis Mayfield, who he had worked with earlier that year. Hathaway became A&R Director at Mayfield’s new Curtom label where he began to make a name as an arranger. That name carried him to Chess Records and eventually to a career on his own, arranging hits from the Unifics, Carla Thomas, the Staple Singers, and the Impressions among others. Before he left Curtom in 1969 Donny had cut a single called “I Thank You Baby.” It was a duet with June Conquest on a Mayfield song. Donny was a substitute for L.C. Cook who couldn’t make the session. The record turned out to be a modest hit, reaching #45 on the R&B chart. In addition to his arranging credentials, Donny had a hit of his own under his belt. Hathaway began to pursue a solo recording career, and went into business with his old college friend Ric Powell. He met King Curtis through Mayfied, and Curtis helped him to get a deal with Atlantic Records. “The Ghetto,” a largely instrumental soul groove, did well as a single, and Hathaway’s first album for the Atco imprint, Everything Is Everything, followed in 1970. At the same time that he was having solo success, Hathaway was hitting it big on duets with Roberta Flack, another Howard University alumnus. The team had hits with the singles “You’ve Got A Friend,” and “Where Is the Love,” and their album Roberta Flack & Donny Hathaway was massive, making it to #3 on the pop chart in 1972. Just before the Roberta Flack & Donny Hathaway album was released Atlantic looked to make the most of Hathaway’s popularity by releasing the Live album, which was recorded at The Bitter End in New York City, and The Troubador in Hollywood. It turned out to be the biggest album of Hathaway’s solo career, reaching #4 on the R&B chart and #18 on the pop chart. Hathaway’s next project was to work on the soundtrack for the film Come Back Charleston Blue. The resulting album included a duet with Margie Joseph on the title track in addition to the studio version of “Little Ghetto Boy,” which was again produced by Mardin. It was after the release of Extensions of a Man that Hathaway’s life began to unravel. Although he continued to attempt to record, mental illness was getting the best of him, and the sessions were often cut short. By 1975 he had begun the slide from which he would never recover, and which would eventually kill him. There was some hope in 1978 when Hathaway and Flack reunited for “The Closer I Get To You,” which was another smash for the pair. He even began to record a new album and the single “You Were Meant For Me,” which was released in August, 1978, was his final hit. For a moment it appeared that things were taking a turn for the better. Then came that dark day in early 1979. Donny Hathaway was buried in St. Louis County, Missouri. When he died, Hathaway’s entire recording legacy consisted of his three studio albums, the live album, and the duets album with Flack. It was all recorded in just a three year period from 1970-1973. Thankfully, as it turns out, there was more music that had never been released. That’s where the new anthology from Rhino comes in. It’s a four-disc set. The first disc is called “Favorites.” It contains 22 tracks that highlight the best of Donny Hathaway’s previously released work. By itself it’s indispensable, but it’s hardly by itself. Disc two has 13 unreleased studio recordings. By all accounts Hathaway was always insecure about his talents. He didn’t like the sound of his own voice. These recordings were never released, but hearing them now is nothing short of a revelation. Disc four is where you’ll find the beautiful Robert Flack & Donny Hathaway duets. In a word, these 13 tracks are unforgettable. The booklet that accompanies the set, written by Charles Waring, provides a comprehensive look at Hathaway’s life and career, including quotes from those who knew him, worked with him, and loved him. First of all, go to the top of the page and “like” this story. Share the link on social media too. It won’t help you win, but it will make me happy. Thanks. Now send an email to ken@popdose.com which contains your name, a valid U.S. mailing address (sorry readers from outside the U.S.), and the answer to the question below, which will demonstrate that you have read at least part of the story. The five winners will be chosen at random from among all the correct answers. What Van McCoy song was included on Donny Hathaway’s self-titled second album? The deadline for entries is 5:00 p.m. Eastern Standard Time on Monday, November 25, 2013. Winners will be notified by email at that time. Good luck!